Metro Detroit lies within Southeast Michigan. It is bordered in the north-east by Lake St. Clair, to the south-east Lake Erie, and the Detroit River which connects these two lakes. Detroit, the state's largest city (and the nation's eighteenth largest) and the county seat of Wayne County. Mount Clemens, the county seat of Macomb County. Pontiac, the county seat of Oakland County. Sterling Heights, the fourth largest city (by population) in Michigan. Warren, third largest city (by population) in Michigan, location of General Motors Technical Center, the United States Army Tank-Automotive and Armaments Command (TACOM), the Tank Automotive Research, Development and Engineering Center (TARDEC), the National Automotive Center (NAC). Some cities are considered within Southeast Michigan, while also being a part of another region or metropolitan area. The following cities tend to identify themselves separately from Southeast Michigan and are isolated from the core counties of Oakland, Macomb, and Wayne. Ann Arbor, county seat of Washtenaw County and home of the University of Michigan's main campus. Adrian, county seat of Lenawee County and home of Adrian College, Siena Heights University. Hillsdale, county seat of Hillsdale County located between the southeast and southwest corners of the state. Howell, county seat of Livingston County located between Metro Detroit and the Greater Lansing areas. Jackson, county seat of Jackson County also considered to be a part of Greater Lansing. Port Huron, county seat of St. Clair County, also considered to be part of the Thumb. Monroe, county seat of Monroe County. Saline, a community in Washtenaw County. Ypsilanti, a community in Washtenaw County, and home to Eastern Michigan University's main campus. With 4,488,335 people in 2010, Metro Detroit was the tenth largest metropolitan area in the United States, while Ann Arbor's metropolitan area ranked 141st with 341,847. Metropolitan areas of Southeast Michigan, and parts of the Thumb and Flint/Tri-Cities, are grouped together by the U.S. Census Bureau with Detroit-Warren-Livonia MSA in a wider nine-county region designated the Detroit–Ann Arbor–Flint Combined Statistical Area (CSA) with a population of 5,428,000. Lenawee County is part of Southeast Michigan, but was removed from Detroit's CSA in 2001. The main economic activity is manufacturing cars. 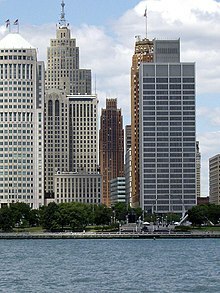 Major manufacturing cities are Warren, Sterling Heights, Dearborn (Henry Ford's childhood home) and Detroit, also called "Motor City" or "Motown". Other economic activities include banking and other service industries. Most people in Livingston, Macomb, Monroe, Oakland, Washtenaw, and Wayne Counties live in urban areas. In the recent years, urban sprawl has affected the areas of Canton, Commerce, Chesterfield, and Clinton townships. The metropolitan area is also home to some of the highest ranked hospitals and medical centers, Such as the Detroit Medical Center(DMC), Henry Ford Hospital, Beaumont Hospital, and the University of Michigan hospital in Ann Arbor. SEMCOG Commuter Rail is a proposed regional rail link between Ann Arbor and Detroit. The Detroit Metro Airport is the busiest in the area with the opening of the McNamara terminal and the now completed North Terminal. The airport is located in Romulus. Manufacturing and service industries have replaced agriculture for the most part. In rural areas of Saint Clair County, Monroe, and Livingston Counties still grow crops such as corn, sugar beets, soy beans, other types of beans, and fruits. Romeo and northern Macomb County is well known for its apple and peach orchards. Most major Detroit radio stations, such as WJR and WWJ, can be heard in most or all of southeastern Michigan. Port Huron, Howell, Ann Arbor/Ypsilanti, Adrian, and Monroe are also served by their own locally-originating stations. National Public Radio is broadcast locally from Ann Arbor on Michigan Radio WUOM 91.7 FM and from Detroit on WDET-FM 101.9 FM. Major television stations include: WJBK Fox 2 (Fox), WXYZ 7 Action News (ABC), WDIV Local 4 (NBC), WWJ-TV channel 62 (CBS) and WKBD channel 50 (CW). Ballard, Charles L. (2006). Michigan's Economic Future: Challenges and Opportunities. Michigan State University Press. ISBN 0-87013-796-4. This page was last edited on 14 March 2019, at 13:15 (UTC).